Passing rates plunged among Illinois' bilingual students this year after they were given the same exams as other students, and dozens of public schools have been deemed failing as a result. Schools across the state—including in suburbs from Evanston to Schaumburg—were stung by the change, as many now face a series of sanctions. Sixty-six schools did not meet progress goals based strictly on the performance of their bilingual students, up from eight a year ago.The students faltered most severely on reading exams, where the overall passing rate went down from 61.4 percent in 2007 to 37 percent, according to the 2008 Illinois School Report Card data made public Friday. The passing rate for math dropped by one point, to 61.1 percent. Ironically, the declining scores among bilingual students widens one of the very gaps that the federal No Child Left Behind law was conceived to narrow. Not since the ambitious law took effect in 2002 have the performance of non-English speaking students and their peers been so disparate, a Tribune analysis shows. "It's a peculiar insanity of No Child Left Behind that kids who are officially designated as 'English language learners' are tested in English which, by definition, they haven't learned. So failure is built in," said Bob Schaeffer of Fair Test, a non-profit group that monitors the quality of achievement exams nationally. . . .
CONCORD – Former New Hampshire Board of Education Chairman Fred Bramante said Sen. John McCain's insistence to push school vouchers prompted him to endorse Sen. Barack Obama's candidacy Thursday. Bramante, a Durham Republican and four-time candidate for governor, became the first delegate to the Republican National Convention in St. Paul, Minn., to abandon McCain. "Senator McCain's support of vouchers is old news," Bramante told reporters during a conference call. "I just can't live with it." . . . . When I began teaching in 1952, the professional literature had much to say about individualizing instruction, teaching thinking skills, preparing the young for democratic citizenship, respecting the integrated nature of knowledge, solving social problems, expanding self-knowledge, transmitting societal values, and so on. And on. Now, more than a half-century later, the literature reads about the same (except maybe for "developing 21st Century skills," whatever those are). Cut through the ideology-driven hype, wishful thinking, sales pitches, fads, re-naming exercises, statistical games, and stump-speechifying, and if anything of real consequence has changed, it's escaped my notice. 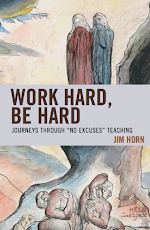 I think we've flat-lined because we're trying to make a silk purse out of a sow's ear-trying to do wonderful things with a fundamentally flawed, 19th Century curriculum that's at odds with both the seamless nature of knowledge and with how the brain works. The current "rigor" push-doing what we've always done, except harder-just compounds the problems. So, with my brother's help, I've assembled an alternative general education curriculum based on systems theory rather than on the academic disciplines, and put it online. In the spirit of "open source" or "open content" offerings, it can be downloaded and used. Free. No strings attached. I see it as a rough draft. Believing that if curricular reform is to have more than a snowball's chance of being accepted it has to come not from Washington or state capitol mandates but from the "bottom up," I've accompanied it with provision for user dialog, feedback, elaboration, etc. You're invited to take a look, to forward it on to others you think might be interested, and at the very least to accept that alternatives to the present fragmented, 1892 curriculum are possible. The number of children entering New York City public school gifted programs dropped by half this year from last under a new policy intended to equalize access, with 28 schools lacking enough students to open planned gifted classes, and 13 others proceeding with fewer than a dozen children. The policy, which based admission on a citywide cutoff score on two standardized tests, also failed to diversify the historically coveted classes, according to a New York Times analysis of new Education Department data. In a school system in which 17 percent of kindergartners and first graders are white, 48 percent of this year’s new gifted students are white, compared with 33 percent of elementary students admitted to the programs under previous entrance policies. The percentage of Asians is also higher, while those of blacks and Hispanics are lower. Parents, teachers and principals involved in the programs, already worried at reports this spring that the new system tilted programs for the gifted further toward rich neighborhoods, have complained since school began that they were wasteful and frustrating, with high-performing children in the smallest classes in a school system plagued by pockets of overcrowding. “They took the knees out of a program that was working,” complained Christopher Spinelli, president of the Community Education Council for District 22 in southeastern Brooklyn. For years, the Bloomberg administration has struggled to rationalize the gifted programs, long derided by critics as bastions of white privilege yet seen by many middle-class New Yorkers as a reason to stay in the city’s public school system. . . . Without the Congressional support to get NCLB, The Sequel passed before the end of the Bush Nightmare, Spellings has done the next worst thing. She and her ed industry goon squad have squeezed through new NCLB regulations that go as far as Spelling can to add public high schools to the Bush/Spellings elementary and middle school list for targeted failures. Unable to impose, without a re-write of NCLB, the same kind of sure-fire test failure mechanism that has been used so successfully in public elementary in middle schools, the new regulations will impose "accountability" on high schools via dropout reduction demands. And if high schools don't reduce the number of dropouts, they will face, yes that's right, sanctions. What kind of sanctions? Firstly, their principals will be replaced, one might assume with the non-educator CEO types that Eli Broad is spending millions to create with his principal training model. And secondly, those schools who don't meet the dropout reduction targets will be required to offer, ta-da, tutoring from the same corrupt, unaccountable, ditto-dispensing dip dog corporations that have been sucking a billion dollars a year from federal education funds to tutor elementary school kids since the passage of NCLB. Imagine for moment an epidemic has struck. One of four patients seeking medical help is dying. In the most vulnerable areas of town, one out of two dies. The mayor declares an emergency and issues a directive that all hospital administrators will be fired if the death rate is not brought under control. And as an added measure in combatting the ravaging disease, the mayor requires that hospitals now must pay, from their current budgets, an exorbitant fee for pharmaceutical companies to set up aspirin dispensaries on every floor of their hospitals. And if these heroic efforts do not stem the dying, then the hospitals must suffer further consequences as yet unnamed. BALTIMORE, Oct. 28 -- One of every six high school seniors in Maryland has not met a new state test-score requirement for receiving a diploma, state officials reported Tuesday, leaving thousands in jeopardy of missing graduation in the spring. Even as state officials disclosed that 9,000 of 54,000 seniors have either fallen short on a battery of four tests in algebra, biology, government and English or have not yet taken all of them, the state Board of Education decided to move ahead with the requirement. Students who do not reach minimum scores can show mastery of the subjects through an alternative path. On a 7 to 4 vote, the board rejected an effort to delay enforcement of the requirement after an impassioned debate, during which one board member shouted into his microphone and another almost broke into tears. . . . In a state that is so broke that it can't hire immigrants to pick up the massive garbage collected along its highways or fix the potholes that could swallow an SUV (a small one), Jon Corzine (D) is looking for ways to do something for nothing. As is often the case in the political world, he has hit upon the opposite result, doing nothing for something--and the something is a new PR campaign for the state's largest corporations. The New Jersey campaign, which is expected to cost about $150,000, will be financed entirely by donations and grants from a cross-section of foundations, businesses and civic groups. Verizon gave $35,000; other supporters include P.S.E.&G., Horizon Blue Cross Blue Shield, State Farm Insurance, Prudential and the New Jersey Chamber of Commerce. Never mind that Verizon alone, for instance, has a national advertising budget of $950,000,000. Even with all that, however, they could not buy what Corzine has handed them for free--the image of a company determined to save the poor urban child from a life of crime and poverty. And never mind, by the way, that these same companies, under the Chamber's banner and the phony research supplied by Achieve, Inc., were at the forefront of an attempt to ditch New Jersey's alternate assessment for high school students who failed the high school exit exam. Which, by the way, is the primary reason that New Jersey's dropout rate is one of the lowest in the nation. I’m just back from an 8-day sojourn in the Midwest. It ended up with 2 days in Grinnell, Iowa, which in turn ended up with a panel that left me feeling elated. Four young(ish) people, graduates of Grinnell, described their life as public school teachers in D.C., Denver, St. Paul and Detroit. They insisted they are in it for the long haul and that while they found it often frustrating, teaching was also wonderful. I found myself drawn in, intrigued, in short—learning from them. One of the speakers was working in a KIPP school. It’s a middle school model much praised for its impact on test scores. It is built upon many of the characteristics of the “military school” model. Tough love. No talking unless called on (including in the halls), uniforms, rote forms of “good manners,” and rewards and punishments for living by the rule. Some of you might guess that it’s not been my favorite model. So I was not prepared for his enthusiasm. But at the end he told a wonderful story, and it reminded me of why I’m still such an enthusiastic “democrat.” He told us that he had, at one point, considered leaving KIPP for another school. He and some friends had begun to explore what happened to many successful KIPP graduates in high school. They were sad, but not entirely surprised, to see how many of them fell apart later on without the tight structure and scaffolding that KIPP provided. They had learned to do things the KIPP-way but had not built in ways to handle more open-settings. Of course they were particularly disappointed at how poorly the kids’ writing held-up. Following this disturbing data, they—unlike too many of us—decided to visit some schools where they heard there was amazing work going on in writing (the panelist was an English teacher). They were surprised by the lack of “elementary discipline” (gum chewing, loud voices, no lining up, hats, etc.) at the school they had come to learn from. How could they learn this way, they asked themselves? But the kids were fluent and competent writers and readers, enjoyed a good argument, related well to adults and each other—in ways KIPP students didn’t. It gave them pause to think. The good news? They raised it within KIPP and were heard; it got everyone to do some fresh thinking. Already, he says, his school has begun to re-examine some of their approaches to schooling. KIPP wasn’t started by experienced teachers or education experts (both founders were Teacher for America graduates)—but they were firm “believers” in the power of knowledge to transform children’s lives. So they responded to issues raised about the school’s impact. If they can learn as they go, who knows where the KIPP experiment will go? But it depends on teachers who are committed to learning from their own teaching and exploring beyond the accepted boundaries. There’s a lesson here for us all. It’s one reason why the most impressive data we used at the schools I’m most familiar with were the results of interviews with alumnae conducted years after they left us. But even that only helps us if we’re open to hearing what they say. For the possibility—however unlikely—that we may be wrong about this or that has to be uncomfortably confronted—over and over. Sometimes it’s small things and sometimes it’s the big ones. It’s this that I hope good schools do for both their kids and their staff—because this habit of what I call “skepticism” is what democracy rests on. The “data” that are the most powerful are not all the proxy data—like test scores—which we have been inundated with. What we need to be listening to are the real experiences of our students and our graduates, and over time their impact upon the larger world as well. More another time about the other three panelists—whose tales were equally compelling if less unexpected. Although… In its detail nothing turns out to be quite the way one “expected.” Not to mention the marvelous three days spent at the North Dakota Study Group (in northern Illinois), my two days spent visiting Chicago schools, and my cancelled speech at the University of Northern Illinois. p.s. I’m still having trouble locating kindergartens that contain any of the following: paint, clay, living things (plants or animals), water, or blocks. I had one success. In The Hollow Men, poet T.S. Eliot describes an apocalyptic desert where children spout eerie, blank chants about the cruel, "straw-stuffed" world they have inherited. Now, in a partisan world where pundit lions roar without substance, children are parched for heroes. Their icons have been spirited away to a stony landscape where nothing ever grows. Sounds like eight years down the road, after a McPalin ascension, where the doddering granddaddy, the GILF, and their Secretary of Neocon Kool-Aid Elizabeth Hasselbeck take funds from schools to brand the system with their harebrained free market scheme. I am a teacher for Los Angeles Unified School District, and this is the specter of a pro-voucher world I live and see every day. Margaret Lamontagne Spellings has come a long way from her humble beginnings as a legislative activist paid to hector public education supporters in the Texas Legislature. With a bachelor's degree in poli-sci and a teaching resume that is limited to a single stint as tutor on education issues to a distinctively non-curious George the Governor of Texas, she has risen to represent the neocon ruling model that insists upon political fealty above competence, ruthlessness over morality, ideology above truth, private aggrandizement over the public good. With her fellow NCLB designer Sandy Kress working under the watchful eye of Karl Rove, who previously hired her to tutor the Governor, these core miseducators put together the infrastructure for an education bill aimed to achieve the conservative goals of education privatization, even without the school vouchers that unsuspecting Democrats strutted about getting stripped from the NCLB Act. As Elizabeth Debray has documented, Spellings and the inner circle knew that the impossible 100 percent proficiency targets would accomplish over time what conservatives would have preferred to get done with the imposition of vouchers on the front end of the Bush reign. Rather than immediate conservative gratification, the Spellings testing requirements offered the kind of torturous schooling, a pedagogical variety of slow-motion waterboarding, that would eventually break down the will of teachers and public school supporters, thus opening up the market for the tutoring corporations, the charter profiteers, and the non-profit corporate brainwashing outfits like KIPP. Now at the end of the Spellings reign of terror and half-way to the 2014 Judgment Day, 4 out of 10 public schools in America are on her NCLB failure list. Special ed children and English language learners who can't read the test questions are tested right along with the rest, including millions of children disabled by poverty. The poorest neighborhoods, in fact, are commanded to perform at the same level as the schools in the leafy suburbs. No excuses. And no extra resources, either. Since NCLB became law in 2002, Bush budgets have underfunded NCLB by nearly $90 billion dollars (pdf). Head Start has been cut back by 11 percent. Career education programs, educational technology, and other programs like Reading is Fundamental have been zeroed out in Bush budgets. While cynically demanding that special ed students perform at the same levels as other students, $30 billion has been cut from the authorized amount in the 2004 IDEA Improvement Act. In short, the poor, the disabled, and the immigrant children have been sacrificed to make an ideological case against public schools and for vouchers and charters (even as research shows they are no better at producing test scores than the schools they would replace. Recently when fielding a question concerning the burgeoning number of schools not making the AYP (Adequate Yearly Progres) cut, Mrs. Spellings limply responded with "pretty much every organization needs improvement." Yes, you are correct, Mrs. Spellings, and "pretty much every organization" accepts this fact, except yours, it seems. Pretty much every other organization does not face closure or reconstitution or some other form of demolition if the organization does not reach a level of improvement that is impossible to attain. As a result of your manipulation, Mrs. Spellings, it is now the public school organization that has lost its most ethical and imaginative professionals on the road to "improvement." It is now only the public school organization that, in seeking the impossible, has had its purposes hijacked so that relevance, caring, and humane values have been extinguished along the way to the unreachable. It is now only the public school organization, Mrs. Spellings, that has so focused on unattainable improvements that children have become alienated prisoners in an institution that blames them for the failure that you, Mrs. Spellings, have created. It is only the public school organization whose resources have been reduced while your scheduled impossible demands have been racheted up (even though there is no level of funding that would make the 100% proficiency goal achievable). It is only the public school organization, Mrs. Spellings, whose most vulnerable and needy member units have been cynically sacrificed on the ideological altar of privatization, even as the empty rhetoric of rescue has been unceasing from your lips. So yes, Margaret, if I may call you Margaret, we are in agreement: "pretty much every organization needs improvement," including, I will add in caps, YOUR OWN. I would argue, in fact, that your organization "pretty much" needs an entire makeover. The good news is that your imminent departure, along with your reluctant former pupil, will make that improvement possible. Perhaps, then, we can get on the road to the real work of public school improvement, rather than the ceaseless undercutting of "pretty much" the entire system. I am sure that the competent and hard working civil servants at the Department of Education will be glad to see you off. With Margaret Spellings getting in a final safari in Africa before she turns in her keys, and as the rest of the incompetent Bush cronies at ED are cleaning out their desks and working on their resumes, the White House has simply side-stepped the Departent of Education and issued its own propaganda response to a recent New York Times piece by Sam Dillon on the impossible testing targets that NCLB uses to undercut the public schools. 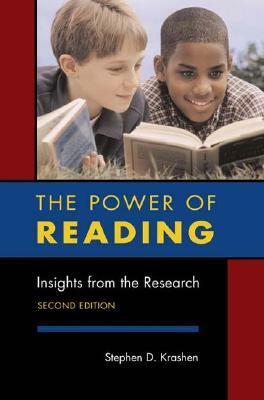 Over the last five years, 9-year-olds in the United States have made more progress in reading than in the previous three decades combined. Achievement gaps between white and black students in reading and math are now the narrowest they have ever been. The first sentence by Zinmeister is simply a bald-faced lie. Here is NAEP's own chart showing average reading scores for 4th grade students. It shows a 2 point gain since 2002. Before NCLB became law, between 2000 and 2002, there was a 6 point gain. (Click to enlarge chart). And here is the NAEP chart on 8th grade reading averages, and the picture is even worse. It shows scores actually dropping a point since 2002. (Click to enlarge chart). In terms of the achievement gap being the narrowest it has "ever been," the final chart from NAEP shows the reality. 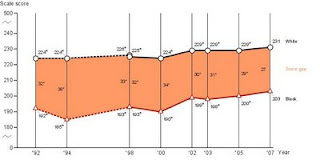 In 2002, there was a thirty point gap in 4th grade reading scale scores. That gap for 4th grade reading has narrowed by 2 points since 2002, even with the draconian full-time test prep chain gang teaching that has replaced caring teachers and balance curriculums in schools with mostly minority and/or poor students. (Click to enlarge chart). It is long past time that these liars, dissemblers, and epistemological thugs be run out of Washington on a rail. Bolivar R-1 Board of Education members unanimously threw their support behind a board resolution supporting the No Child Left Behind “Recess Until Reauthorization” Act at the board’s monthly meeting Thursday. The NCLB Recess Until Reauthorization Act, or House Resolution 6239, is sponsored by Congressman Sam Graves and would call on the U.S. Congress to reform the NCLB Act. The resolution expresses the board’s support for Graves’ proposal, which would suspend the NCLB until it can be reformed and provide relief to school districts such as Bolivar facing penalties under the law. “I feel strongly that we should go ahead and do it,” board member Mona Coleman said. “I don’t think we should consider not doing it, we just need to do it,” J.R. Collins said. Superintendent Dr. Steve Morgan said the board was not giving up on the children who were meant to be helped by NCLB, but that they were recognizing the demands of NCLB need to be re-evaluated and changed. The resolution was proposed by the Missouri School Boards’ Association, which sent out a mailing about it to its members across the state. Brent Gann, communications director at MSBA in Columbia, said, “What we’re wanting to do is collect these resolutions, and when we have all of them that we think we’re going to get, we’re going to send them to our congressional delegation.” . . . .
No one remembers that the SAT was designed to predict the success of college applicants. It is now simply an "objective instrument" used to justify the expansion of privilege and status for those who can afford it. Most have even forgotten that NCLB was billed as a tool to give extra help to struggling schools, while everyone can see that it now functions as a "scientifically-based" tool to shutter the public schools and segregate the poor in prison-style testing camps run by zealots with tons of tax-deductible corporate cash. Now the College Board is rolling out a new product to do for the 8th grade what the SAT did for the senior year: turn the final year of middle school into a testing hell camp for the pushy parents who can afford the tutoring needed to prepare their Caitlins and Seths to ReadiStep their way up the backs of less financially-endowed classmates whose high school expectations will be mailed to them in a College Board envelope before they ever enroll in a high school. Thus we become able to separate even earlier the human capital from the human liabilities, which was the point of the old school eugenics movement as well. Amid growing challenges to its role as the pre-eminent force in college admissions, the College Board on Wednesday unveiled a new test that it said would help prepare eighth graders for rigorous high school courses and college. The test, which will be available to schools next fall, is intended only for assessment and instructional purposes and has nothing to do with college admissions, College Board officials said. The College Board, which owns the SAT and PSAT, made its announcement when an increasing percentage of high school students are taking the rival ACT and amid mounting concern over what critics call the misuses of the SAT and ACT and other standardized tests in college admissions. Those critics dismissed the new test for eighth graders as just what Dr. Jones said it was not: “a pre-pre-pre SAT.” . . .
. . . .Amid perhaps the most important presidential election since 1932, the statements about education by our presidential and vice presidential candidates, even in the face of our current economic crisis and the wars in Iraq and Afghanistan, stuck with me more strongly than any other utterance in the debates. There is no secret why: I am a high school teacher. The night of the final debate, I was exhausted. My feet were aching—a consequence of standing on the job for the better part of 10 hours every day as a teacher of United States history. I wanted to relax, but my mind was racing; there is a lot to think about these days. We have seen a “bailout” of corporate and Wall Street swindlers, with the working class being forced to pick up the tab. The administration has continued to escalate defense spending while cutting taxes, never seeming to consider the dire social, international and economic consequences. With all the burdens being loaded upon Americans today, we deserve a break. Struggling homeowners deserve a break, not the devastation of foreclosure. Hardworking families deserve a break, not the shock of unemployment. And public educators deserve a break, not the damaging mandates of program improvement and the threats of state takeover that have fallen on my high school and countless others like it due to the draconian quotas of the No Child Left Behind Act. Sadly, NCLB doesn’t care about strong relationships in the classroom; NCLB cannot measure smiles, teamwork, camaraderie or the overcoming of adversity. It doesn’t allow for creative and authentic assessments and engaging activities in the classroom. And, tragically, it has demanded that we educators check our hearts and souls at the classroom door. . . . Rising test scores are no reason to celebrate, author Alfie Kohn told teachers at the Utah Education Association (UEA) convention on Friday. Schools that improve test scores do so at the expense of other subjects and ideas, he said. "When the scores go up, it's not just meaningless. It's worrisome," Kohn told hundreds of educators on the last day of the convention. "What did you sacrifice from my child's education to raise scores on the test?" Kohn, who's written 11 books on human behavior, parenting and schools, spent nearly two hours Friday morning ripping into both established and relatively new education concepts. He slammed merit pay for teachers, competition in schools, Advanced Placement classes, curriculum standards and testing - including Utah's standards and testing system - drawing mixed reactions from his audience. "Considering what we hear a lot, it was pure blasphemy," said Richard Heath, a teacher at Central Davis Junior High School in Layton. Kohn called merit pay - forms of which many Utah school districts are implementing this year - an "odious" type of control imposed on teachers. "If you jump through hoops, we'll give you a doggie biscuit in the form of money," Kohn said. He said competition in schools destroys their sense of community. Advanced Placement classes, he claimed, focus more on material but don't do much to deepen students' understanding. He said standardized tests are designed so that some students must always fail or they're considered too easy, and often the students who do poorly are members of minority groups. "We are creating in this country before our eyes, little by little, what could be described as educational ethnic cleansing," Kohn said. He called Utah's standards too specific and the number of tests given to Utah students "mind-boggling." He called on teachers to explain such problems to parents and community members. "The best teachers spend every day of their lives strategically avoiding or subverting the Utah curriculum," Kohn said. . . .
New York Times's Front Page Coverage Hides the Story of "Nearly 100 Percent Failure of All Schools"
"For most schools, the greatest risk of failing AYP lies with ELA proficiency," said Cardullo, a professor of biology. 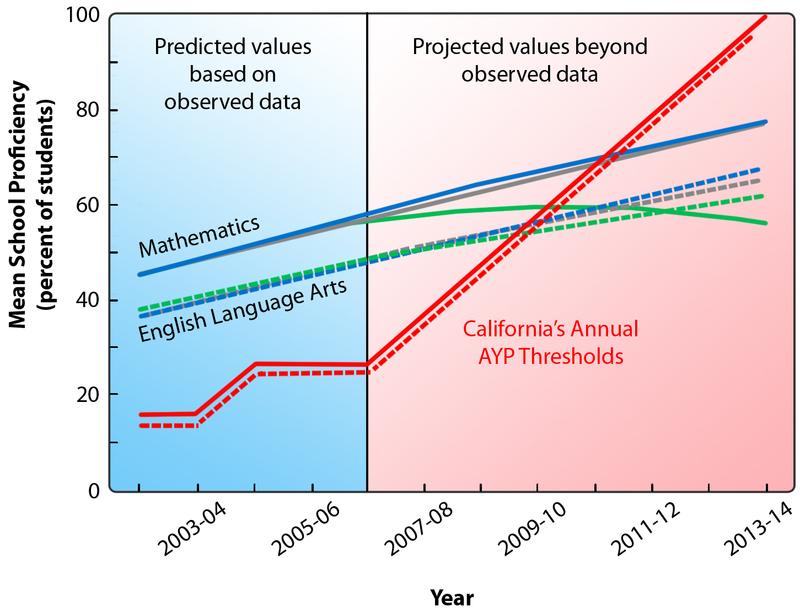 "It is the Socioeconomically Disadvantaged and English Language Learner subgroups within the schools that are most likely going to fail to meet AYP in California. Given the weakness of ELA progress, no doubt more emphasis needs to be placed on ELA. But what we emphasize in our paper is that schools are also in need of support in mathematics since the current data trends, if not altered, predict nearly 100 percent failure of all schools by 2014 in meeting AYP." Not that there was anything really new about this Cardullo peer-reviewed finding of 100 percent failure rate. Dr. Bob Linn, former President of AERA, presented and published the same predictions five years ago based on his own analysis. I know because I was at CREATE in Memphis in 2004 when he brought his well-traveled slides (pdf) there. In fact, Dr. Bob Linn appears in yesterday's story near the end of the piece on A14, but the 100 percent failure rate that he has talked about for five years is conspicuously missing from the Dillon story. Not a word. Instead of reporting on the guaranteed failure rate of public schools and the accompanying erosion of public support by a manipulated and unsuspecting public (hey, hockey moms and Joe Sixpacks! ), the Times yesterday chose to focus on the states' various lengths for their testing fuses as we move toward the 2014 explosion that is never mentioned in the Times story. After all, the Times Editorial Board is in the tweek-and-repeat NCLB camp, and their support for cheap charter chain gangs in urban centers is not to be compromised by too much of the harsh truth. The Times graphics department is even called upon to show which states are taking the slow fuse route and which ones have decided to instill heartbreak, demoralizaton, and nervous breakdowns in their children and teachers before 2014. Four big charts!! with the underlying message that the long fuse states are cheating themselves from the quick suicide that they deserve. Here is the chart from the Cardullo study (Download the high-resolution JPG version of the image) that the New York Times refused to publish, the one that tells all the truth that the Times refused to print. The Times did not even offer a link to it. Pathetic. Had the Times chosen to report the indisputable fact that NCLB was designed to show school failure, they would have been forced to acknowledge their own continuing complicity in the child and teacher abuse that business, government, and media have agreed upon "to make the U. S. competitive in the world economy." If there has ever been a bigger bunch of idiots in charge of our future, I have not found it yet in all my study. That reminds me--I will have a Olbermanesque Special Comment on Margaret Spellings this evening, I hope.
. . . .Standardized testing has a role to play, but it is blind because it ignores, necessarily, the human element. Its role is to do that. But if we make it the centerpiece of our education policy, then we strip from our educational system the very thing most valuable about it: the goal of making for each student an optimal future, in which she can shape her own destiny. There has to be a person-to-person experience, in which the content of an educational process is humanized, impassioned, made to come alive, in which one mind engages with another, and the student learns not just about the question-and-answer process, but also about what makes that intangible quality that is the intellect, what empowers the individual to apply what is learned and to interpret the abstract terrain of thought and consequence. Our educational system cannot be about programming students for testing. Aside from the fact that this is nothing more than building a system designed to cheat itself —the tests are supposed to examine cognitive ability, not test-taking preparation—, it undermines the most necessary aspect of a successful educational system: that of cultivating intellectual curiosity and the willingness to test the world's claims against one's own judgment and comprehension. This may be one of the most fundmental areas in which we need to reform our common culture: we are not educating test-takers, we are educating human beings. And a free citizen, capable of accessing all the benefits of a free society, must have at the core of his self-awareness, an intellect that knows it can be applied, that it can assess, relearn, inquire, challenge and distinguish between ideas, the less good and the better. I say this with equal parts gravity and enthusiasm, and after a great amount of consideration. It's certainly not something I am in the practice of doing. In my long tenure at T.H.E. Journal, I have aggressively advocated for the education and technology communities, but have stayed clear of endorsing candidates for office. It can be bad for business, as well as a little presumptuous. But this country can no longer afford to have tepid support for technology in education from the federal government, when all other facets of our-- and the world's-- economy and society are leveraging technology to make changes in how they operate. . . .
. . . . In many ways Locke High School concentrates the utterly failed education system that “serves” the oppressed people in the urban cores of this country. In 2005 only 332 Locke students graduated from a class that, as ninth-graders, had 1,318. Only 143 students qualified for admission to the University of California and Cal State University systems. In March, 2005 a 15-year-old girl died after being shot in front of the school. 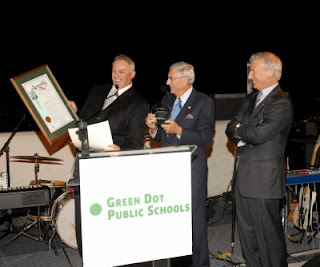 Even before the fight at Locke became national news, the L.A. school district had signed a contract agreeing to turn complete control of Locke over to a private charter school organization known as Green Dot Public Schools. 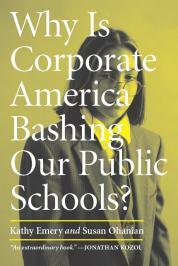 (A charter school is a public school run by a private business or organization.) This isn’t the first charter school in the Los Angeles Unified School District (LAUSD). And it’s not the first of Green Dot’s charter schools in L.A.; they already operate twelve small charter schools. But this is the first time that any charter operation has been given sole responsibility for providing the public education that high school students receive in a section of a major urban ghetto. And a lot of people at Locke—parents, the teachers and administrators who stayed on, many students, and people all over—are hoping that Green Dot will actually be the model for “closing the achievement gap between black and Hispanic students and their white and Asian peers” that the sales pitch of the charter school movement promises. Green Dot aims to produce a small number of students from inner city schools who will help fill the need for “knowledge workers” in this society—people who work with information, such as engineers, analysts, marketers, etc. And for those who do make it into the “knowledge worker” strata, to serve as a political and ideological force to shore up this system of exploitation and inequality—including by providing a basis to claim that “anyone” can make it in this system; a cruel lie when in fact, for millions and millions of youth in the inner cities, their so-called “opportunities” are the streets and a likely early death, prison, or the military. . ..
My Friends (and Fellow Prisoners)? There are many educationists and educators who have been so brow-beaten by conservatives intent upon preserving the current out-of-whack social system that they have abandoned, even, the term "social justice" from their working vocabularies. Of late, we see half the term, "justice," surviving in some schools' guiding documents, as if the Constitution and the legal system will be enough to combat the corrosive effects of racism, classism, sexism, and heterosexism that undergird, and undercut, our social lives. With the disappearance of the term, social justice, there goes, too, the principles and practices aimed at combatting oppression, hatred, bigotry, and the more subtle behaviors and policies that perpetrate the many unfairnesses surrounding race, class, gender, and sexual orientation. One of most prominent examples of capitulation occurred recently with the national accrediting concern, NCATE, and its decision to follow the path of least resistance by caving to right-wingers who are angered and threatened by the prospect of a teacher corps committed to dispositions grounded in principles of equity, equality, and fairness. Such is the state of politics in America, when social justice can be successfully demonized as a partisan value that is too offensive to remain on our list of cherished institutional ideals. It is encouraging, then, to see the goals of social justice making a comeback, even if it is on Madison Avenue and not in the agencies where we might expect it, say, in the institutional values of what was at one time the most respected teacher education accrediting body of the Land. FOR the first time since the Advertising Council was founded in 1942, the organization — which directs and coordinates public service campaigns on behalf of Madison Avenue and the media industry — is introducing ads meant to tackle a social issue of concern to gays and lesbians. The campaign, which is scheduled to be announced by the council in Washington on Wednesday, will seek to discourage bullying and harassment of teenagers who are gay, lesbian, bisexual or transgender. There will be television and radio commercials, print and outdoor ads and a special Web site devoted to the campaign (thinkb4youspeak.com). Some spots feature celebrities, the young actress Hilary Duff and the comedian Wanda Sykes, delivering the message. The campaign is on behalf of a nonprofit organization in New York called the Gay, Lesbian and Straight Education Network, or Glsen (pronounced glisten), which promotes tolerance among students. Glsen is spending about $2 million to develop and produce the campaign. . . . The bigtime merchants of greed have retired to their barricaded penthouses overlooking the financial district, passing back and forth footballs made of ten-thousand dollar bills from the federal treasury and toasting the last eight years of successful pillaging. In the meantime, the small change merchants of greed have come to New Orleans and other urban centers, where charter schools are replacing most of the public schools that were blown up by natural disasters (Katrina) and by manmade disasters (NCLB). These bottom-feeding greed merchants of the ed industry have been handed the schools to exercise their marketing savvy and their business acumen, where oversight of accounting practices (test scores) are non-existent and protection of consumers (children and parents) is nowhere to be found. And, of course, due process and decent benefits for workers (teachers) is a thing of the past. As reported in the Times-Picayune, edu-entrepeneurs are out canvassing the Wal-Mart parking lots around New Orleans looking for families with children of school age, preferably non-poor 6th graders without learning difficulties or other special needs. And no one wants fourth graders or eighth graders in particular, since children in these grades have to take the high-stakes LEAP test, and where the peristaltic bulges of failed children are the largest. (See chart from the Times-Picayune). These charter-preneurs are handing out gas cards and other incentives to get parents to enroll their children in one of their new untried and unregulated school storefronts, where the future generation serves as the guinea pigs in one of the riskiest social experiments ever devised by the U. S. Chamber of Commerce and the Business Roundtable.
. . . .Beabout promised confidentiality to principals he interviewed. One, he said, spoke of wanting to serve families from the middle-class neighborhood surrounding the school. The principal sought to win accreditation for a prekindergarten program specifically with this in mind. "We had our initial meetings . . . to work on a (national) accreditation because that's a big thing with all these young little yuppie . . . moms and stuff, I want to" attract, the principal told him. The intensifying battle for students in New Orleans comes at a time when even some staunch advocates of school choice have tempered their views on the degree to which competition for students leads to improved school quality. One of the original theories behind school choice held that parents would pull their students out of bad schools, forcing their closure, and that remaining schools would improve their programs to attract students from those closed schools. But the persistence of some flagrantly bad schools -- whether traditional, charter or private -- in cities with strong choice programs has sparked some doubt, experts say. "The more competition, the more there's an incentive for schools to manipulate information to present themselves in the strongest possible light, " said Jonah Liebert, an assistant director at the National Center for the Study of Privatization in Education at Columbia University. Liebert does not necessarily believe that competition is a bad thing, but, like Hess, he thinks cities like New Orleans need to strengthen the quality of information and do a better job connecting with parents. The district did hold a poorly attended school fair last spring. And New Schools for New Orleans works with several other organizations to put out a parent's guide to all of the public schools, including a page outlining the school's program and application process. . . .
Kozol's unblinking truth has never been a subject covered by corporate media, who prefer to lambast schools for low test scores rather than reporting on the return of apartheid schooling in America or the cognitive decapitation of black children under the brainwashing methods approved by Bush-crony crackpots like Reid Lyon, Doug Carnine, or Roland Good. Jonathan Kozol prides himself on speaking up for those whose voices are stifled in the midst of segregation and discrimination. The poor, the homeless and the underprivileged are groups of people Kozol defends in his candid books. On Thursday night in Slee Hall, Kozol presented his lecture "Letters to a Young Teacher," based on his book of the same name, to a sold-out crowd. Kozol, a long-time educator, fights especially hard for an equal opportunity to education for all children. The enthusiastic crowd, consisting of mostly teachers, professors, administrators and prospective educators, was looking for tips and inspiration from Kozol. Kozol referenced a school principal in his past that changed his point of view forever. "I like to think of myself as a CEO instead of a principal," said Kozol, reciting a line the principal once told him. Kozol said this kind of perspective hinders the role an administrator plays in students' lives. "From then on, I knew I had to do something to change education," he said. Kozol became a teacher at one of the most segregated public schools in Boston in 1965. The Boston School Committee disputed segregation in their schools, leading Kozol to make the public aware of the separation of races. He was eventually fired after reading a poem by Langston Hughes to his fourth grade class. The entire event was depicted in his early novel Death at an Early Age, he said. "It's the best thing there is to do in life," Kozol said of teaching. Throughout the lecture, he reiterated the effect teachers have on students and the responsibility they take on when accepting the role of an educator. "You should never interrupt a child while they are asking a question because more often than not, a treasure will be found at the end of the run-on sentence," Kozol said. "Value your students as the future of American society." Segregation in the educational system didn't ended even after Brown v. Board of Education, the 1954 Supreme Court case that overturned a previous court ruling allowing segregation in public schools. Kozol said that research he has conducted found that race and racism are the main difference between inner-city school districts and suburban school districts. "Schools are more separated now than in 1968," Kozol said. "The separation of quality of schools is leading to the rise of apartheid in the United States of America." In his lecture, he attacked the No Child Left Behind Act (NCLB), which aims to improve academic performance in U.S. primary and secondary schools through federal programs that raise the standards and expectations for students. "The NCLB in its entirety is a shaming ritual meant to discredit the idea of public schools," Kozol said. He explained that the NCLB is a prime example of how the U.S. government is pushing the divide between children who are able to get a good education and those with disadvantages. "The NCLB is meant to bridge the gap of learning between races, which is good, but the government is doing it the wrong way. They are teaching more privileged children less instead of teaching less privileged children more," he said. The lecture was part of the 2008-2009 Charlotte C. Acer Colloquium on Urban Education and the UB graduate School of Education Dean's Lecture Series. Kozol wanted all those in attendance to know that they could make a difference. He explained that students in the American education system need teachers that will react to the times, organize parent support and build support among other educators. In his lecture, Kozol set guidelines for the educators of our time. "If you care about what you want to change, then it shouldn't be any trouble attempting to fix the problem," Kozol said. It was a call to arms against what Kozol sees as the lackluster educational system in America. New Jersey has been randomly drug testing high school athletes for two years now, and for their efforts, they have netted exactly two offenders out of the 2,000 tested. That's two souls, total. With those kinds of results, and with education budgets crunched to the point of eliminating school bus service in many communities of the state, wise political leaders such as Richard Codey have decided that it is time for state-sponsored random drug testing for all of New Jersey's high schools. The effect on students, of course, will be to instill an acceptance of constant surveillance as a way of life, as well as the acceptability of search and seizure practices that were once unacceptable under the Constitution. Now that's learning that won't be forgotten at the end of the day! FOR two school years now, New Jersey’s scholastic athletes have been randomly tested for steroid use. The dragnet has hardly bagged enough abusers to burn out the lights on the scoreboard at any high school football field: Of about 1,000 athletes tested statewide at the beginning of both school years, only two tests were positive, one each year. The program, the first of its kind in the nation, will be used again this school year — it will be the third year of the program — with about 500 more students among 240,000 athletes to be tested through a private agency by the New Jersey Interscholastic Athletic Association. Now, the State Legislature, with the support of athletic directors, wants to put the force of law behind the tests. “I want kids to think that there’s a cop at the end of the corner, so they don’t speed,” Bob Baly, the assistant director of the athletic association, said of the testing program. A bill co-sponsored by State Senate President Richard J. Codey, who issued an order for the association to carry out testing during his term as governor, was introduced in an effort to toughen the state’s stance against steroids. The bill passed in the Senate unanimously in April and has been referred to its Education Committee. The bill, which would mandate that the testing continue, also seeks to ensure that school athletic programs from boys and girls provide education about the dangers of steroids, performance-enhancing supplements, alcohol and drugs. How much state money would go to these programs has not been determined. . . .
. . . . We have known for many years that the SAT is a relatively weak predictor of academic success in college, adding little to what admissions offices can glean from high school grades, class rank, writing samples and other assessment tools that predict performance in the real world, including the classroom. Probably the single most important study in recent years reaffirming this conclusion was published in 2001. University of California researchers examined some 80,000 student records and found that high school grades and the SAT subject tests were significantly better predictors of college grades than the SAT. And we have long understood that the exam quite powerfully reinforces and amplifies inequalities of educational opportunities between rich students and poor ones. The 2001 University of California study, for instance, found that the SAT subject tests and high school grades bore virtually no relationship to the socioeconomic status of individual students - quite contrary to the robust relationship of SAT scores to the socioeconomic background of test takers. Given these shortcomings of the SAT, it's wondrous that so many colleges and universities have stuck by it for so long. Institutional habits die hard. Under threat of losing its largest customer, the University of California system, the College Board unveiled a new SAT just a few years ago. But those changes never addressed the fundamental flaws of the test and how colleges were using it - and misusing it - to make important decisions about admissions and financial aid. Amid this turbulence, the NACAC report promises to be a watershed event in American higher education. 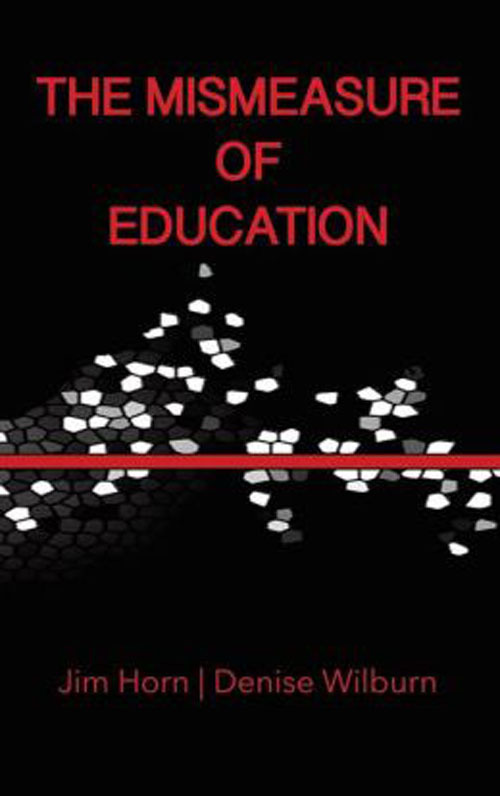 A widely representative group of educators and higher education leaders authored it, chaired by Fitzsimmons of Harvard. And they produced the report at a time when many colleges and universities are grappling to find ways to make their institutions more inclusive and less the bastions of privilege. In the current system, dominated by privilege, elitism and money, a marginally bright rich kid can get into a top college because of a well-prepped SAT performance, while the creative genius from an impoverished family is lucky to attend a community college - or to go to college at all. College "quality" in the current higher education market is primarily determined by an institution's selectivity in admissions, which in turn is determined by the median SAT score of entering freshmen. The college rankings game, orchestrated by U.S. News & World Report, entrenches the dominance of median SAT scores as a measure of quality. . . .
Why Does the L. A. Times Ignore the Facts on NCLB Proficiency Targets? Maybe we can forgive the NYTimes and WaPo for not reporting the California research, but the LA Times? If the preeminent science journal, Science, printed a research report that showed all the public schools in my state would be listed as failures by 2014, don't you think that a newspaper calling itself the Los Angeles Times would find that worth a mention? Not yet. On the contrary, the LA Times exhibits the same bare-knuckled, no-excuses position of the ed industry and the conservative privatizers, the same ones who have, since Bush came to Washington, accused anyone who questions the impossibility of their testing targets as engaging in the "soft bigotry of low expectations." Their bias is evident in the proficiency story the Times did run in early September when the latest state test scores were published. The headline: "Only 48% of California high schools meet federal standards, even with easier measure." If the undisguised hostility in that headline is not enough to let you know where they stand, their refusal to print news on the research that helps the public understand the realities of NCLB makes it crystal clear. They are under the influence of the corporationists who have no problem engaging in the hard racism of impossible demands in order to crush the public schools and usher in charterization. He said, "For most schools, the greatest risk of failing AYP lies with ELA proficiency. It is the Socioeconomically Disadvantaged and English Language Learner subgroups within the schools that are most likely going to fail to meet AYP in California. Given the weakness of ELA progress, no doubt more emphasis needs to be placed on ELA. But what we emphasize in our paper is that schools are also in need of support in mathematics since the current data trends, if not altered, predict nearly 100 percent failure of all schools by 2014 in meeting AYP." According to information released by UC Riverside, Cardullo and his colleagues are calling for "reforms based on research that would tie educational experiences to instructional challenges of a particular school, while focusing each school's resources to serve its own unique student population." The research project was funded through NSF's Math and Science Partnership program. The complete paper can be read by AAAS members on the Science magazine Web site here. Additional details can also be found in an article published by NSF here. Supplemental materials, including methodology, can be downloaded in PDF form here. . . .
As we hover on the brink of giving to the thieves a supply of replacement cash equivalent to that which they have stolen, it is instructive to look at the not-so-subtle extortionary power that Wall Street has across the board. Can you imagine what kind of barrel we would be over if Bush had been successful in dumping Social Security into the laps of the Mammonites of Wall Street. In a move suggesting how the credit crisis could disrupt American higher education, Wachovia Bank has limited the access of nearly 1,000 colleges to $9.3 billion the bank has held for them in a short-term investment fund, raising worries on some campuses about meeting payrolls and other obligations. Wachovia, the North Carolina bank that agreed this week to sell its banking operations to Citigroup, has held the money in its role as trustee for a fund used by colleges and universities and managed by a Connecticut nonprofit, Commonfund. . . . I am still looking for a national news outlet that will say something, anything, about the study just published in Science that shows unalterable failure descending on all the elementary schools of California as a result of the NCLB's school-exploding, child-crushing, and teacher-demoralizing act. Not one so far. Instead, the Washington Post today is focused on the rise of test scores among test-abused poor children, which does nothing, nada, zero, to the incessant grinding of the NCLB juggernaut with its impossible proficiency demands. Their praise simply reinforces the self-imposed blindness of the hopelessly-hopeful neoliberal. Today the Aiken Standard reports that this year's test results show 80 percent of the schools in South Carolina are already NCLB failures. Disbelieving pols even delayed the release of the results until they could run the numbers again. The numbers, gentlemen, are correct, even as the conclusions are not. And what is the universal reaction in South Carolina? Is it have a statewide press conference of superintendents to denounce this idiocy, or to march on Washington, or to stage a school shutdown, to go on television to explain to the public? No, one lonely assistant superintendent has the audacity to talk to the press about being "punished for having high standards." (Excuse me, sir, but your state just chose the steady march to assured mass failure, rather than adjustable rate balloon payment method that California chose). More than 80 percent of South Carolina's elementary and middle schools didn't meet federal Adequate Yearly Progress (AYP) goals this year - a statistic that didn't surprise state and Aiken educators, but does frustrate them. The U.S. No Child Left Behind (NCLB) legislation bases AYP results on PACT tests and levels of proficiency achievement for elementary and middle schools. Schools must meet proficiency requirements for the overall population and in subgroups of minority, low-income, special education and English as a Second Language (ESL) students. The State Department of Education delayed the release of high school AYP results over concerns of possible computation errors. That data will be released with state and district results. One problem with NCLB, said Aiken Associate Superintendent Dr. Kevin O'Gorman, is that South Carolina has a higher proficiency requirement than most other states. "We're punished for our high standards," he said. "It isn't fair to judge schools on that." At the same time, NCLB demands a moving target of proficiency. When AYP went into effect six years ago, schools needed to average around 17 percent proficiency in each population group. Now the requirement is around 58 percent. "NCLB doesn't recognize improvement," said State Superintendent Dr. Jim Rex in a conference call Wednesday. "It categorizes a school as (not meeting AYP), whether the school missed by an inch or a mile. We have taken the charge seriously in terms of high expectations and, in many cases, our schools are being labeled unfairly." . . . .
Edit and adapt this opinion column for your local newspaper. Include the name, address, telephone number and credentials of the person submitting (library director, president of library board, trustee, school/campus administrator, community activist, etc.). Edit and adapt this opinion column "Elect to Read a Banned Book" for your local newspaper. Include the name, address, telephone number and credentials of the person submitting (library director, president of library board, trustee, school/campus administrator, community activist, etc.). Throughout the country, most children are starting a new academic year. Teachers are sending out their lists of required readings, and parents are beginning to gather books. In some cases, classics like "The Adventures of Huckleberry Finn," "The Catcher in the Rye," and "To Kill a Mocking Bird," may not be included in curriculum or available in the school library due to challenges made by parents or administrators. Since 1990, the American Library Association's (ALA) Office for Intellectual Freedom (OIF) has recorded more than 7,800 book challenges, including 458 in 2003. A challenge is a formal, written complaint requesting a book be removed from library shelves or school curriculum. About three out of four of all challenges are to material in schools or school libraries, and one in four are to material in public libraries. OIF estimates that less than one-quarter of challenges are reported and recorded. It is thanks to the commitment of librarians, teachers, parents, and students that most challenges are unsuccessful and reading materials like "I Know Why the Caged Bird Sings," "Slaughterhouse Five," the Harry Potter series, and Phyllis Reynolds Naylor's Alice series, which topped OIF's most challenged list in 2003 and ended the four-year reign of J. K. Rowling's Harry Potter books, remain available. The most challenged and/or restricted reading materials have been books for children. However, challenges are not simply an expression of a point of view; on the contrary, they are an attempt to remove materials from public use, thereby restricting the access of others. Even if the motivation to ban or challenge a book is well intentioned, the outcome is detrimental. Censorship denies our freedom as individuals to choose and think for ourselves. For children, decisions about what books to read should be made by the people who know them best—their parents! In support of the right to choose books freely for ourselves, the ALA and [Name of Library] are sponsoring Banned Books Week (September 25 - October 2, 2004), an annual celebration of our right to access books without censorship. This year's observance is themed "Elect to Read a Banned Book," and commemorates the most basic freedom in a democratic society—the freedom to read freely—and encourages us not to take this freedom for granted. The American Booksellers Association, the American Booksellers Foundation for Free Expression; the ALA; the American Society of Journalists and Authors; the Association of American Publishers; and the National Association of College Stores sponsor Banned Books Week. The Library of Congress Center for the Book endorses the observance. American libraries are the cornerstones of our democracy. Libraries are for everyone, everywhere. Because libraries provide free access to a world of information, they bring opportunity to all people. Now, more than ever, celebrate the freedom to read @ your library! Elect to read an old favorite or a new banned book this week.